Full ACCESS to all homes. It's FREE / no obligation. This home search site is updated (about every minute) with prices, maps and photos of homes, foreclosures, short sales, HUD homes and more. Our company isn't huge (that is why it's nice) and we will take good care of you during your move. 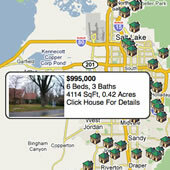 You are one step away from seeing all listings from every realty broker in this area. Enter the portal to all the active homes for sale, right here.